Knitting with ADHD is like going for a jog and realizing you’ve tripped only when your palms and knees skid against the unforgiving pavement. I’ll be happily knitting at the end of the row and then realize the stitch count is off by an unfixable margin. Suddenly, something I know how to do (like following directions in a lace chart) is a skill I doubt. On a typical day, living with my ADHD means asking myself “Why am I doing this?” and, with resignation, asking my brain to stop. It’s constant noise from my incurably restless hands and legs, it’s “waking up” from zoning out and wondering how much of the day is lost, it’s looking up from the middle of my screen, noting the time, and realizing I haven’t taken a break for 5 hours and I’ve been forgetting to blink. It’s fighting with my brain, trying desperately to hold off these inevitable habits. So tasks that require my full concentration, like knitting, can offer quite the challenge (as much as I hate to admit it). Me pumping myself up for a task. Knitting with ADHD makes reading charts over long spans of time (which can be as little as 5 rows) really difficult, which is why a detailed lace chart causes me such problems. But I love knitted lace, and so I try and try again; my obsession with organization and my penchant for perfectionism assist me in the fight. I come up with rules to tackle the challenges of knitting lace charts, like not knitting when I’m tired and taking breaks between complicated rows to reset my attention countdown. I figure out different ways to trick my brain into doing what I want it to, but this often takes multiple attempts. Sometimes it feels like a game of Whack-a-Mole. Real life pep-talks with my brain. Why knit if my ADHD causes so many difficulties? Well, there are two reasons; the first being that I love to knit, and the second is that knitting can actually help calm my fidgeting habits. 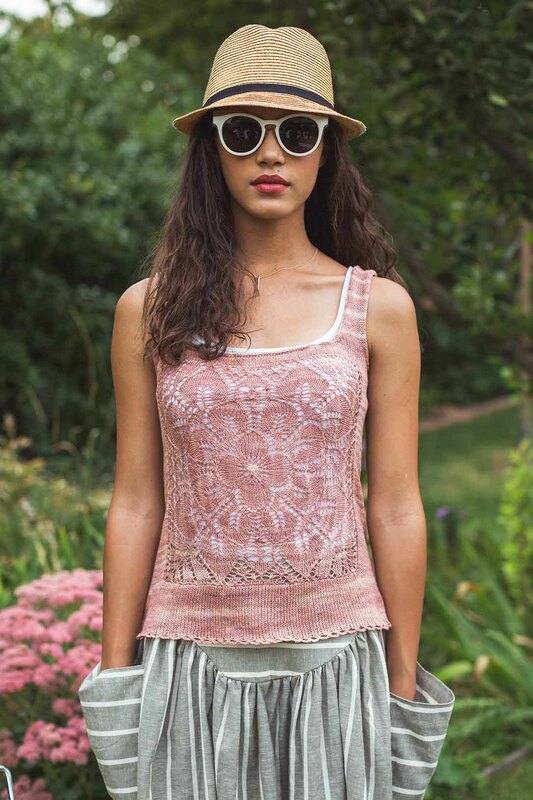 So I’m really excited to tell you about my current challenge: the Seashell Tank by Heather Zoppetti from knitscene Summer 2018. Behold, my third attempt! 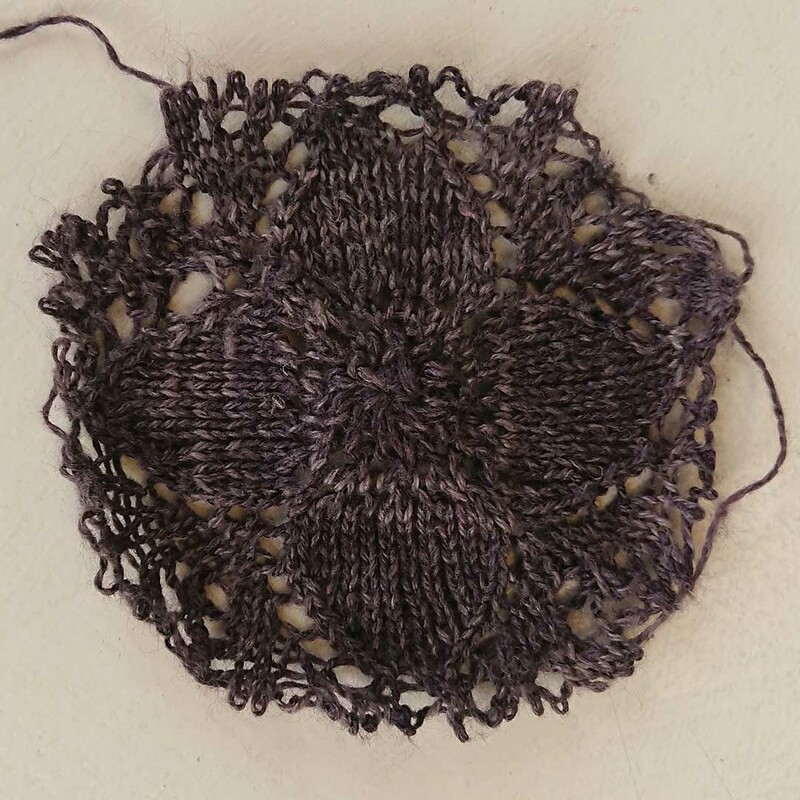 I can’t seem to get past the first flower chart without it all going wrong, but this little swatch is so pretty that it inspires me to keep knitting. 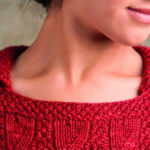 The tank’s beautiful lace panel is a challenge to knit but it’s a great project for stopping excitedly to see the pattern your knitting unveils. Plus I love the yarn, Anzula Breeze, in this charcoal color. It’s soft, light, and lovely, even through many frogging events. I plan to wear this tank over dresses or a cami with shorts this summer! I now have a lot more respect for the generations of women who hand-made doilies for their homes and the homes of others. The lace panel is worked in the round like a doily, which is something I never thought I would attempt to make. And once I get past the lace, it’s all mindless stockinette which like to think of as my reward for completing the intricate lace panel. Fingers crossed it works out! 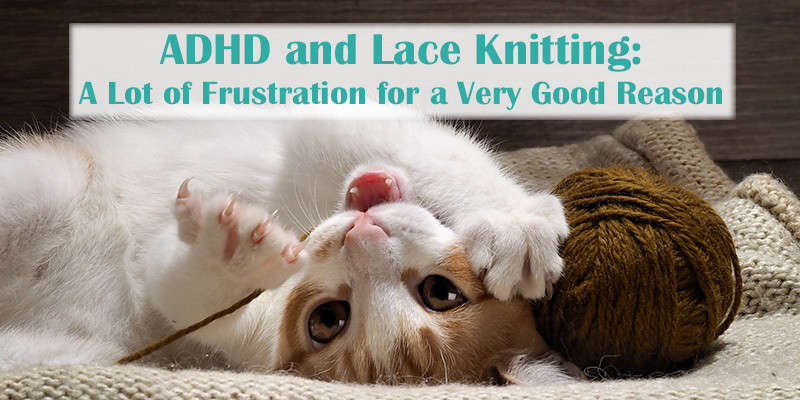 Do any of you struggle with taming your ADHD while knitting? Do you have any ideas or brain rules to share? Consider the “Lifeline” that Kate Atherley (http://kateatherley.com/) writes about in “Beyond Knit & Purl” (I would italicize the title if I could…you can find it (1) here: https://bit.ly/2vLma2f; (2) here: https://amzn.to/2FgRaXg; and (3) here: https://bit.ly/2HtBkKN AND probably other places as well). You can obviously insert a “Lifeline” however many times you like! Kate Atherley calls this a “Lifeline,” because just in case you get lost in your lace, you can rip out a section but only up until the “Lifeline” row. Now all is not lost! If you’ve placed “Lifelines” after every pattern repeat, then it’s not a total tragedy requiring you to start from the beginning (just the last “Lifeline”). Thank you, Leah! I can’t wait to give it a try! I too love the look of lace and have had some challenges learning to work within my own comfort zone. I have trouble reading the charts themselves, and now color them so each stitch has its own color. I remember colors better than symbols and it calms the visual jumble for me. For repeats within the chart I use simple markers. A pack of simple silver rings works perfectly and I color mark the two ends so I always know right from wrong side. I also do better with a row counter that hangs from the knitting itself. Worth the money for a chain counter so I always know where I left off. Simple tweaks that have made the knitting itself so much more enjoyable and productive for me. Happy knitting and hang in there, that’s a gorgeous pattern!! I may have to go shopping this weekend. Thank you for the suggestions Andrea! Oh yes I totally get it! I was diagnosed with ADD in college and began to understand myself better. Thus, the reason I have so many WIPS. I squirrel, a lot.